Hello and welcome! This month has flown by, August arrives this weekend. Yikes! 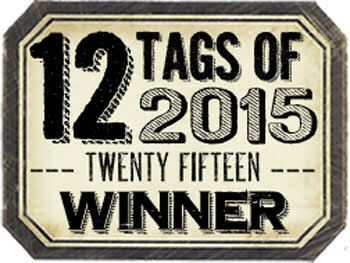 With that being said it's time to share my version of this month's tag by Tim Holtz. 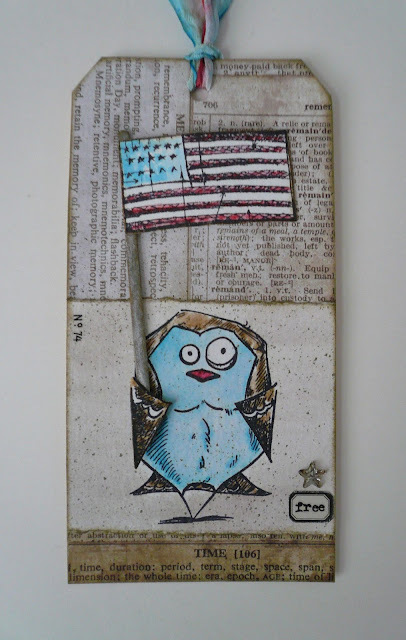 I went with the patriotic theme like Tim but took a detour with a crazy bird or in this case a free bird. Thanks so much for stopping by! HE IS A CUTIE!!! Love him holding the flag! Cute cute take! Congrats on your win!!! Love your take on Tim's patriotic July tag, and so happy you won! Congrats! Sooo Cute!! Congrats on your win!!! Congratulations on your win...I just "LOVE" that bird holding the flag..."STINKING CUTE! I like, LIKE, LOVE it! So whimsical. I like it, congrats! Congratulations on your July win! Love his patriotism. How cute is your free bird...congrats on your win! So cute! Congrats on your win! This is too cute! Love your tag! Congratulations on your win! Love your patriotic bird...so cute! Congratulations on your win.